→How To Choose The Best Bakeware Sets In 2017? How To Choose The Best Bakeware Sets In 2017? If you are interested in baking cakes, cookies, chocolates or any other baked item, you need to buy the Best Bakeware Sets. At times, choosing the best bakeware set can be a challenge if you are a first-time buyer. The reason for this is that there are tons of these products on the market with different prices, features, and benefits, making it hard for interested buyers to determine which one is worth buying. 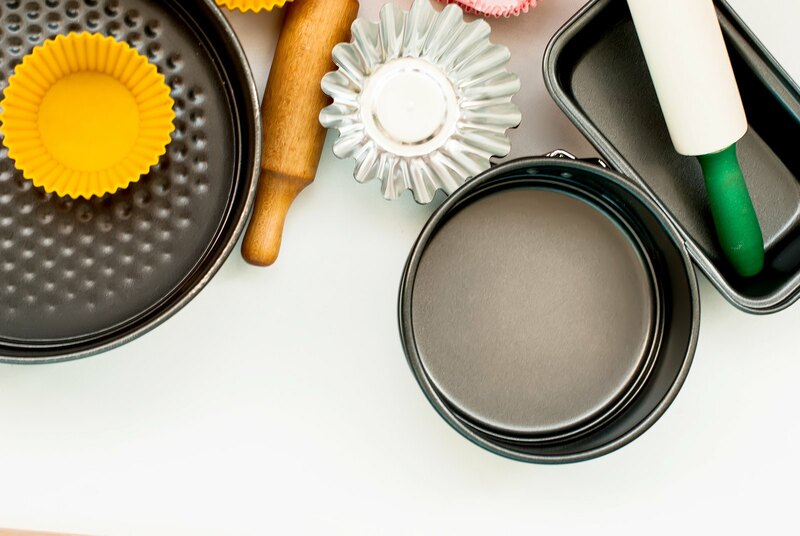 To eliminate the hustle of picking the Best Bakeware Sets, here is a comprehensive guide to help you know how to go about it. The guide contains detailed formation about Bakeware Sets and then recommends the best 5 products which might be worth your money. Just read on to learn more. Why Purchase Bakeware Items As A Set? There are several reasons why you should purchase bakeware items as a set. Myself, I like to purchase kitchen cookware as a set because I find it cheaper and more convenient than purchasing them separately. A typical Bakeware set comprises of a wide variety of components such as large cookie sheets, bread pans, cake pans, mixing bowls, pie dishes, measuring tools and much more. So basically you are getting all these items as a set when you purchase them at once. Another benefit of purchasing a bakeware set is that you get matching items when all of them are bought as a package. For instance, if you want multiple mixing bowls of the same color and design, you will get them as a set. When searching for the best bakeware set, it is important to consider the type of material the Bakeware Sets are made of. 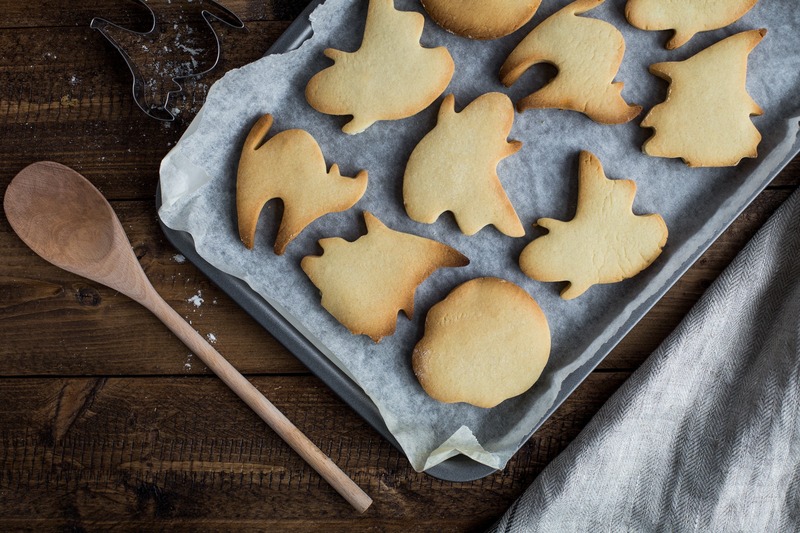 Below are common types of materials used to design bakewares. I like bakeware cakes made of aluminum because it allows foods to be baked evenly. Another advantage of this material is that it is not prone to warping. However, aluminum bakewares have a shiny texture so they won’t be good if you want to use them for browning. It is also not advisable to use aluminum bakeware whenever you want to prepare acidic foods. 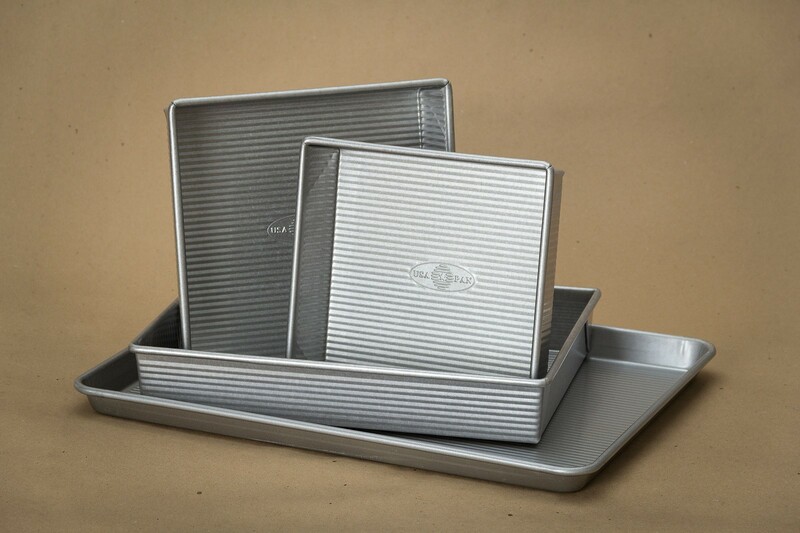 You can also consider Bakeware Sets made of stainless steel. One advantage of this material is that it is very economical and lightweight. In my case, I don’t like stainless steel items because they are poor conductors of heat. When using these items, they distribute heat unevenly producing baked items which are not properly cooked. I’m not taking of ordinary glass but tempered glas﻿﻿s. This material is a good conductor of heat so it allows food to cook evenly and quickly. They heat up evenly and quickly this saving you a lot of fuel. One drawback of this material is that it is prone to breakage if not handled properly or when it is subjected to extremely high heat. These are steel, aluminum or cast iron Bakeware but with a non-stick surface. This is a high-quality coating which prevents food from sticking to the surface. Another advantage of this coating is that it gives these items to have a darker look which in turn boosts heat conduction. If you are looking for a Bakeware set that cooks food evenly and one that produces dried out food, one with a non-stick surface might be a good option. This is either aluminum or steel, with another layer of air sandwiched between. This is a deliberate construction which helps in browning and ensures even cooking. One drawback of this material is that it heats up slowly and therefore you will require more time to bake your food. Other materials, though not common in making bakeware stuff, include stone, cast iron, and silicone. Each of these materials has its own advantages and disadvantages. For instance, stone bakeware takes a longer time to fully heat up but retains heat and distributes it evenly. As stated earlier, choosing the best bakeware set can be quite a challenge if you are a first-time buyer. That said, I have outlined a number of factors to consider when searching for the best bakeware set for your kitchen. Read on to learn more. You should factor in the type of material certain Bakeware set is made of before purchase. I have already covered different types of materials used and highlighted some of their merits and demerits. You should consider items with a non-stick coating. Baked foods normally stick on material without a non-stick surface. This may cause them to break when you attempt to remove them from the Bakeware. Price is one of the most important factors to consider when choosing the best Bakeware set for your kitchen. Several factors include the features, materials, designs and brand go into determining the price of these products. I have done a thorough research and found that a good bakeware set will cost between $20 and $100 but you can spend less money and still find a capable and durable product for your kitchen. 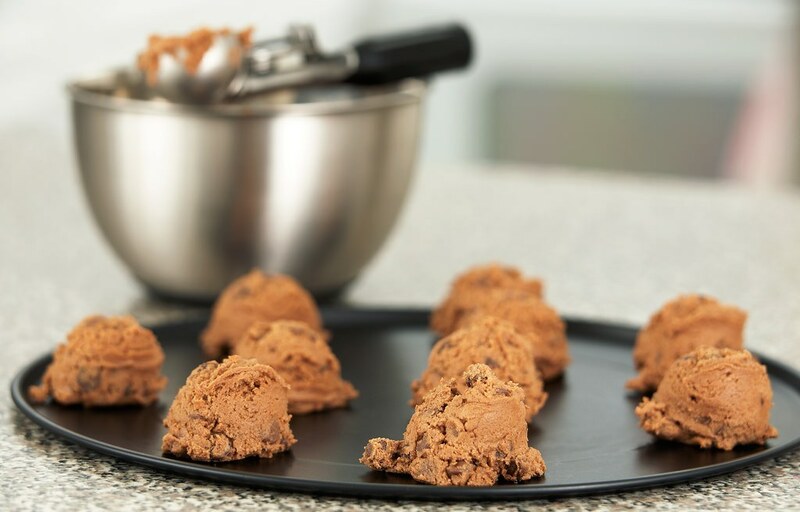 Heat conductivity is another important factor to consider when you want to best bakeware to help you cook baked goods. The extent of heat conductivity depends on the type of material used. Materials with more heat conductivity ensure that your food is baked more quickly and evenly. These materials also heat up more quickly so you are able to cook your food quickly than you thought. You don’t want to spend your hard earned cash on an item which will last for few days. Choose an item that can last for several years without thinking of a replacement. When it comes to durability, I prefer Bakeware Sets made of stainless steel because they last long while maintaining their original look. Size is also another factor to look for in a Bakeware set. Just make sure you have purchased an item that consumes less space on your kitchen countertop. 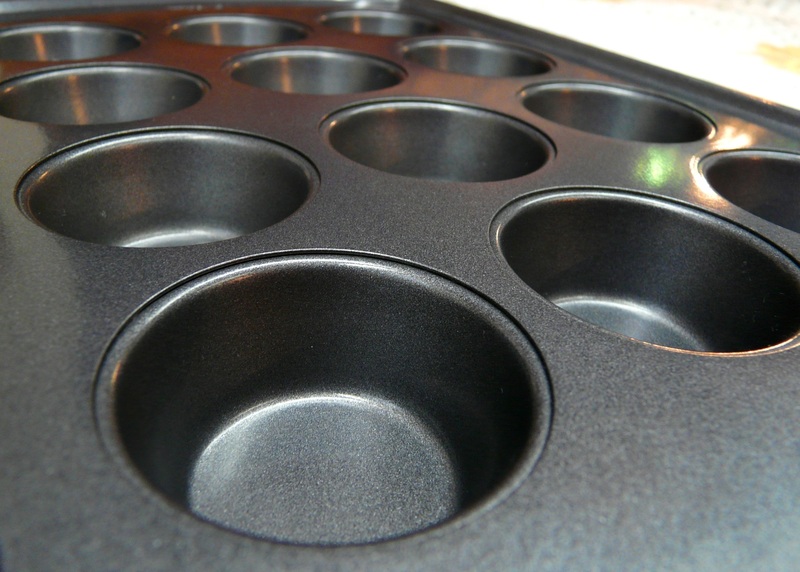 The size and amount of baked goods that you want to cook also determine the size of Bakeware to choose. When shopping for the Best Bakeware Set, just keep in mind that some metals react with acidic foods. For instance, aluminum won’t be the best choice if you are planning to cook acid foods. If you insist on this material simply because it is cheap, your food will react with some of the metal rendering it unsafe for consumption. This is a short video on how to choose a bakeware. In this section, I’m going to show you the Best Bakeware Sets which you can consider purchasing for your kitchen. I arrived at these 5 picks based on their total reviews and overall rating on Amazon. Read on to learn more. After releasing Cucina 4-Piece Bakeware Set, Rachel Ray has also released another bakeware set known as Oven Lovin' Non-Stick 5-Piece Bakeware Set. This is a high quality set with all essential baking items you can use to bake or roast your foods. The set includes a 10 by 15-inch crispy sheet, a 9-inch loaf pan, a 9 by 13-inch rectangular pan, and two 9-inch round cake pans. The sets feature extra wide handles, which makes it easier for you when you want to lift your Bakeware plus food. All the pieces are made of carbon steel with a non-stick finish on the interiors. The interior finish makes the Bakeware’s surface dishwater safe but also prevents sticky food from sticking to the surfaces. Another appealing feature of this set is the pieces with rolled rim edges to reduce chances of warping. The handles of these pieces are made of silicon which provides a comfortable and secure grip. The pieces are dishwater safe so you don’t have to worry about cleaning. The first Bakeware set in this list is the Calphalon Nonstick Bakeware Set. This is an innovative set which bakes even the stickiest foods you will think of. 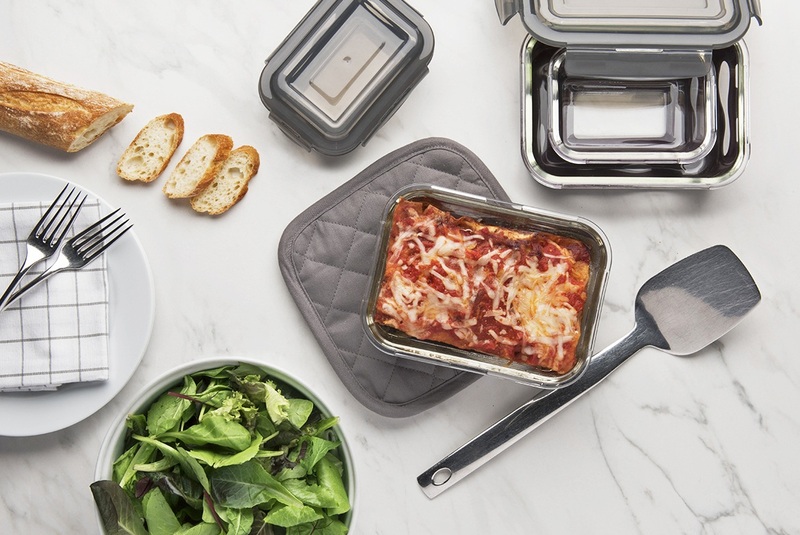 The set comes with a 10 by 15-inch cookie sheet, 12-cup muffin pan, a medium loaf pan, a 9 by 13-inch cake pan, and two 8-inch round cake pans. Each piece is made of heavy-gauge steel core which heats up quickly, evenly and does not warp. The interior part of each item is finished with an interlocking non-stick coating which prevents food from sticking to the surface. The coating has a lighter color to ensure that your food browns evenly. With this bakeware set, you will bake your goods with confidence knowing that they will be cooked and browned evenly without sticking. When it comes to ease of cleaning, you don’t need to worry because the sets are dishwasher-safe. 76893.05 Bakeware Set is another Bakeware Set from Sunbeam which gives you everything you need for baking. This set includes two 8.5-inch round cake pans, a 6-inch cup muffin pan, 8.5 by 4.5-inch loaf pan, and a 15 by 10-inch cookie sheet which you can use to bake homemade candies and cookies. This Bakeware set is made of high-quality carbon steel so you get a product that is durable. The interior of each piece is coated with finished with a xilan non-stick coating, a surface that makes the release of baked goods easier. All the pieces are dishwasher safe but the manufacturer recommends hand-washing. This is a reasonably priced Bakeware which comes in a variety of shapes that are useful for any of your baking tasks. So if you are searching for an affordable non-stick Bakeware set for your kitchen, this set from Sunbeam might be a great choice. Utensils made of steel will damage the coating. If you are looking for a bakeware made of glass, then Pyrex Easy Grab Glass Bakeware Set might be worth considering. This is a versatile 19-piece set which includes 3-quart Oblong, 2-quart Oblong baking dish, and 1.5-quart 8-inch Loaf Dish with matching covers. The set also includes 1, 1.5 and 2.5- quart mixing bowls, 4-10-ounce rimmed custard cups and a 9.5-inch pie plate. These pieces come with ergonomic handles which are large enough for easy handling. The set also features easy snap-on lids so you don’t have to worry about transportation and storage. All pieces in this set are also made of nonporous glass so you won’t worry about any odors and stains. Soft contours for easy cleaning. Material that doesn’t absorb stains or odors. Features a contemporary design which goes from oven to table. Material may shatter on extreme temperature. Circulon 5 Piece Symmetry Bakeware Set is another non-stick bakeware set in the market that might be worth considering. The set includes a 9 by 5-inch loaf pan, two 9-inch round cake pans, a 10 by 15-inch cookie pan and 9 by 13-inch rectangular cake pan. The round cake pans might be good for you if you want to make layer cakes. The rectangular cake pan is perfect for making sheet cakes and brownies. The set’s baking surface is coated with a high quality non-stick coating to prevent sticking and rusting, and also to make cleaning easier. The pieces come with wide handles which offer secure and comfortable gripping. 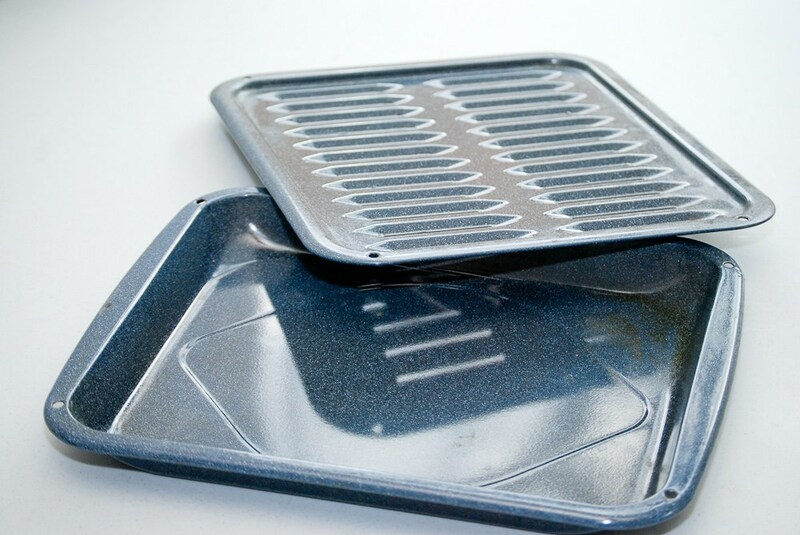 The bakeware set comes pieces made of strong carbon steel which is able to resist warping. It features rolled-rim design for improved look and durability. It is an energy-saving set which is oven safe up to 450 Degree Fahrenheit. After careful consideration, the bakeware set that appeal to me most is the Pyrex Easy Grab bakeware set with blue lids. I found this 19-piece set very versatile, durable and good looking. Another thing that makes this set my top pick include ergonomic handles and easy snap-on lids which eliminate the hassle of handling and transportation. However, if you are not comfortable with glass Bakeware Sets, this option might not be good for you. You need to consider other sets that I have reviewed above. Just feel free to share this article with your friends, if you have found it helpful. If you have any question about Bakeware Sets, also feel free to raise it in the comment box below.